Oh Fall, there are so many lovely things about it such as the colorful leaves, the crisp cool air, and the smell of campfires. There is also one thing that isn't so fun when it comes to cooler Fall weather. Eczema! Ick. Once the air gets dry in Fall I notice that my Eczema comes out and it's so obnoxious! It's embarrassing even though 35 million infants, children, and adults suffer from Eczema! So in honor of October being National Eczema Awareness Month, I've decided to let you in on a secret. You see, I always try to stay ahead of the game and catch it before it gets worse as the weather gets even colder. And my favorite way to do that is with Aveeno Eczema Therapy Moisturizing Cream. It's fantastic because it contains Ceramide to help replenish and maintain my skin's protective barrier. It relives dry, itchy, irritated skin all over my body thanks to the ACTIVE NATURALS Colloidal Oatmeal. 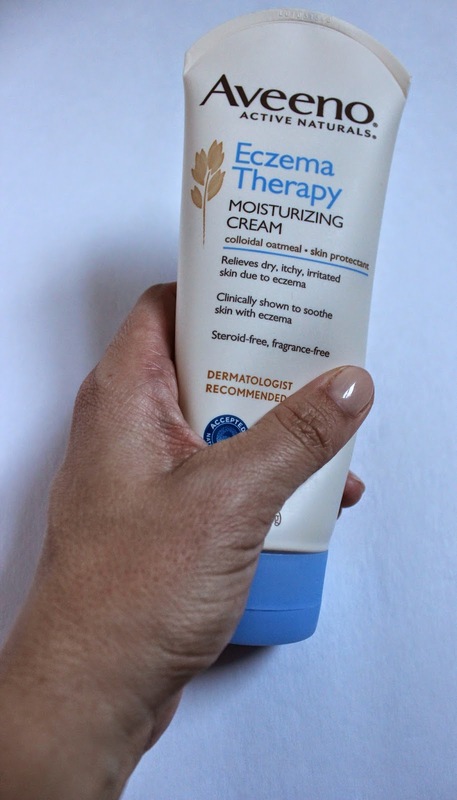 This cream is shown to improve 4 symptoms of eczema - itch, redness, dryness, and irritation in just FOUR WEEKS! There's nothing worse for me than dressing in an adorable outfit for work and then constantly dreading my attire because it's hard to get the itchy spots scratched on my back and on my legs. That's why using this cream has been a miracle for me! 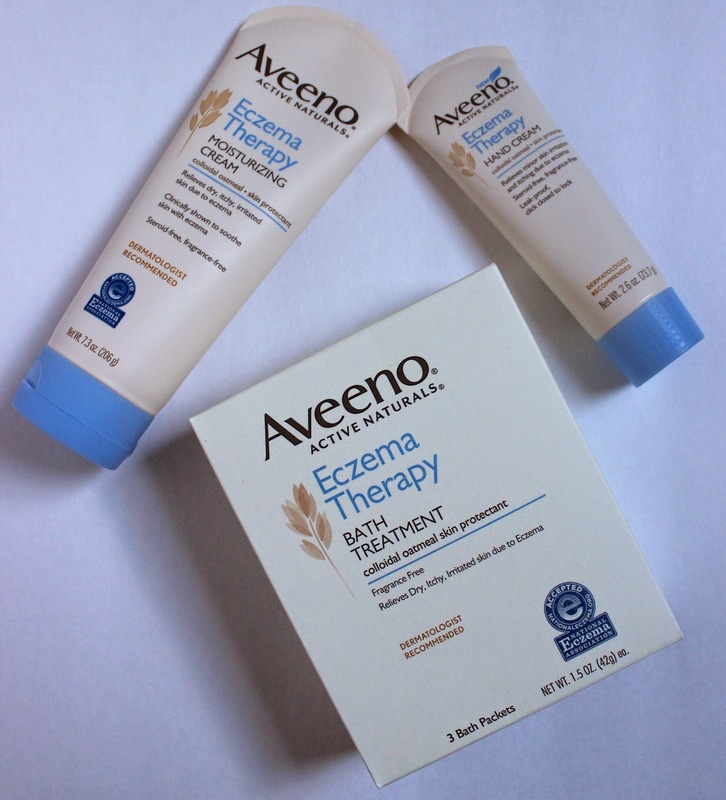 I'm not alone either because it seems on the AVEENO Facebook page there are many other people raving about the Eczema Therapy Line! If you use computers a lot like I do, you understand how annoying it is to constantly have to stop typing and itch your hands. It can end up getting painful if you scratch too hard! 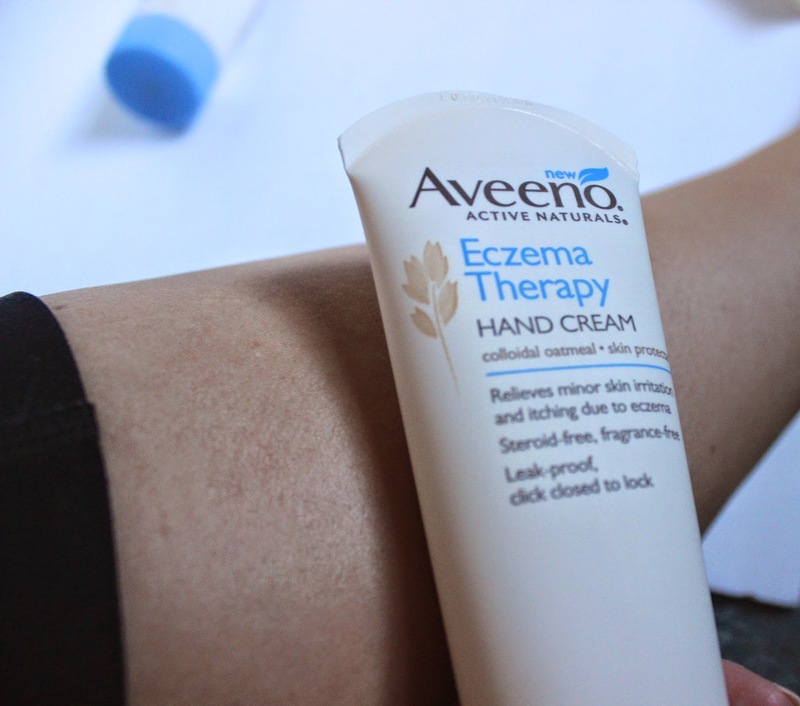 So of course another favorite product is Aveeno Eczema Therapy Hand Cream. It can improve the overall appearance of your hands in just one week! And no worries about irritating your skin more, because the natural ingredient (ACTIVE NATURALS Colloidal Oatmeal) is gentle yet effective. If you have enjoy baths, you may want to check out their Eczema Therapy Bath Treatment. It disperses in bathwater to create a milky tub of water that soothes you and naturally cleanses your skin. It's great for kids too! Remember that there are many ways to cope with Eczema. According to Dermatologist Kenneth Beer M.D., you should look for products with ceramide, which is an essential lipid naturally found in skin that actually plays a major role in enhancing and restoring your skin's protective function. You should also remember to use fragrance free laundry detergent to wash your clothes, sheets, and towels. If you can, avoid dryer sheets. Also, don't use products with fragrances or harsh drives. And even body lotions with irritants can actually aggravate your skin and cause Eczema to flare up! I'm not sure why I get Eczema, it can be caused from stress, heat and sweat, sudden changes in temperature, and it's even hereditary. I honestly think it's from the changing seasons so that's why I always make it a point once Fall is in the air, to properly protect and care for my skin. I am so thankful to have a great product to help improve the condition of my skin when Eczema tries to ruin my season! Both the regular cream and the hand cream absorbed instantly and never left a greasy residue so it's been an absolute pleasure using them! I no longer have red blotches on the back of my hands in the Fall and I don't get little hot spot itch spells! So tell me, do you get Eczema? What will you do now that you've read this post? Comment below or Tweet me with #AveenoEczemaTherapy with your answer! I am definitely going to need to try this. I have Keratosis Pilaris which is kind of similar to eczema. I work in an office on the computer and I can totally relate to the stopping to itch your hands thing!